I completed a major lecture Thursday so I treated myself a short stargazing run in the driveway that evening. Transparency was rotten – it was so humid here that even with the temps in the low 70s I was still sweating, and with all that water vapor to bounce back the city lights, the sky was bright to about 45 degrees above the horizon. I did a quick turn around the sky with my old 7×35 binoculars, which I’d not used in ages, and all I could see were the major constellation outline stars. I decided to see what the C80ED could do, in part because it’s my best grab-n-go scope and I knew it would be a short run, and in part since I’d just had it out under much darker skies. I started on M57, the Ring Nebula, which is obvious even at low power under most conditions. This time out, the Ring was just a ghostly blob in averted vision at any magnification, even when Lyra was still quite high. But the seeing was rock-steady. Epsilon Lyrae, the famous double-double star in Lyra, was very elongated, like a pair of 8s, at 68x, and cleanly split – juuuuust barely – at 100x, although I had to go up 136x to easily hold the split in direct vision. After that I bopped over to Cassiopeia/Perseus to split some doubles (Eta Cass was nice) and look at the Double Cluster. Didn’t attempt a sketch, I was just rolling for aesthetic appreciation, but I did use a lot of magnification and spent more time on the clusters than I usually do. I had not noticed before that NGC 884 has an empty center. I mean, under dark skies there are plenty of stars in the middle, but the bright stars form a series of arcs around the edge, and under so-so skies those outer bounding arcs of stars are all you can see. NGC 869 is the opposite, it just gets more and more concentrated toward the center, albeit unevenly. 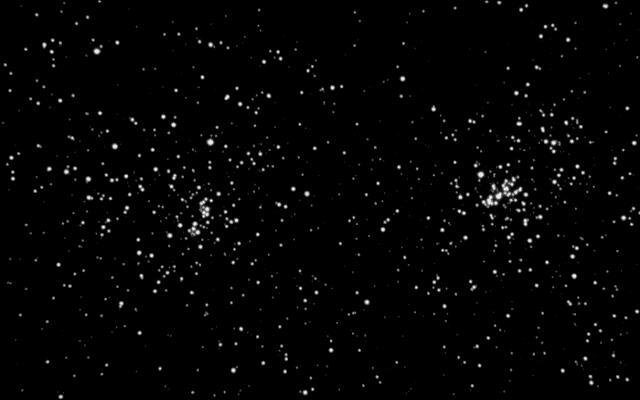 The Double Cluster: NGC 884 (left) and 869 (right). Photo borrowed from SEDS. At 11:20 the clouds suddenly thickened up – in the space of five minutes I went from pleasant observing to totally socked in. After I got everything stowed, I went inside and looked up Stephen O’Meara’s entry on the Double Cluster in his Caldwell Objects book. His observations were gratifyingly similar to mine, but I learned some interesting stuff about the clusters. They are BIG and they are distant: 7300 light years, compared to less than 4000 light years for most Messier open clusters, and dimmed by about 1.5 magnitudes by intervening dust clouds. One shudders to think about how much more impressive they’d be if they were only half as far off and not obscured by interstellar dust. Anyway, a good run. We’re clouded out this weekend, so I’m glad I got it in. You are currently browsing the 10 Minute Astronomy blog archives for the day Saturday, October 17th, 2015.